The Ultimate Organizer! The Grid-It system provides endless configurations for your digital devices and personal effects. Conveniently sized for your iPad case, you'll save time on the go by easily finding what you need. GRID-IT! is the most versatile organization system available. 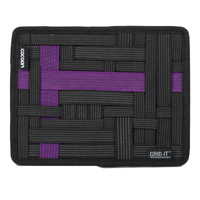 With a rubber woven elastic object retention system for gadget organization you'll have endless configurations to hold items firmly in place.